Nexor is exhibiting at the National Cyber Security Centre’s flagship IA and cyber security event, CYBERUK 2017, held at the Arena & Conference Centre in Liverpool from 14th to 16th March. The three-day event brings together cyber security leaders and professionals from across the UK’s information security communities, from both public and private sectors. The paper examines the disconnect between the perception that the Cloud is inherently insecure, with the reality that it may actually be more secure than traditional, on-site file storage, retrieval and management systems. The paper argues that it doesn’t particularly matter which security protocols you are following in the Cloud. As with conventional online security, if you apply strong principles around secure information exchange – the Cloud Cyber Essentials – effective solutions will be found. Indeed, some industry experts even argue that the Cloud is more secure. Leading organisations worldwide are migrating workloads to the Cloud to improve the security of critical workloads. In the white paper, we look at the principles behind the Cloud that present security challenges, and explore where responsibility for solving the issues lies. It also considers the governance approaches to manage these complex responsibilities, and explores the data lifecycle and core touchpoints to protect the critical data. Finally, the paper describes a proven approach based on tried and tested architectural models to enable the use of Cloud Services for sensitive data. “Cloud security approaches will evolve over time. We welcome the opportunity to meet with those with an interest in the Cloud to discuss the concepts and the applicability in real-world use cases”. 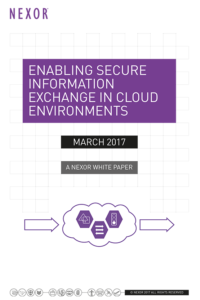 The “Enabling Secure Information Exchange in Cloud Environments” white paper can be downloaded for free from our website.